Chimney mount to be used on chimneys in good to excellent condition. 2 stainless steel straps! 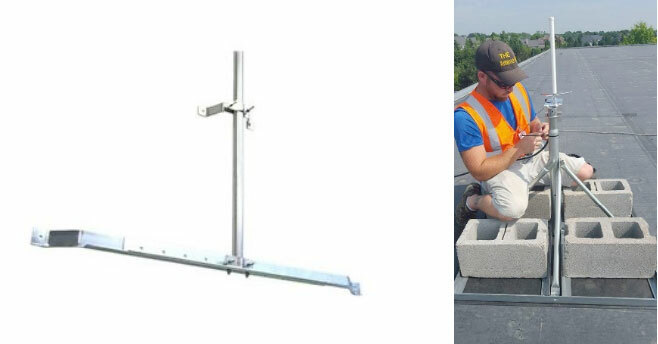 Non-penetrating mounts for flat roof using 8” x 16” masonry blocks for ballast. 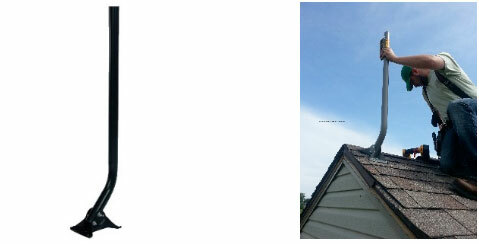 20’ or 26’ heavy duty aluminum mast – ¼” wall, schedule 80 2” O.D. 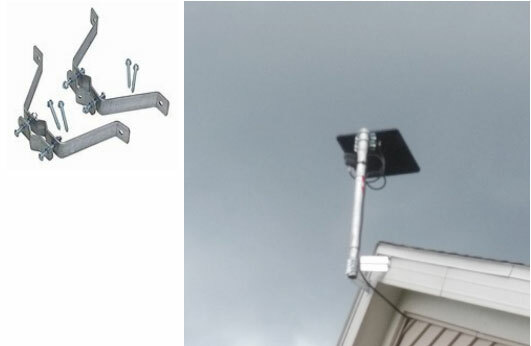 Ground spike & fascia brackets • Less expensive option to 30’ tower! • Below Bishop tape to seal mount to shingles. • Swivel mount for J-mount on gable fascia. Golden Nugget Tower, 10’ sections — Good for 20’, 30’ or 40’ heights. 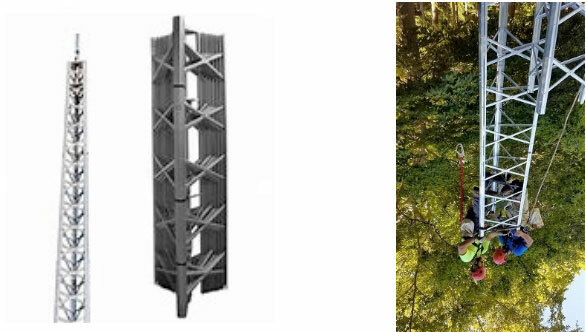 American 25G tower 10’ sections • Engineered good for 30’ to 80’ installations or higher. Typically bracketed to home or structures. The Antenna Men have 4 certified tower climbers. Call for details! • We remove old towers also! • Call for quote! Fully insured, Liability, Umbrella, Workman’s Compensation! Thousands of jobs done since 2008! Over-the-Air TV transmitters & their signal profiles. In the U.S. today most broadcast TV signals are being transmitted in digital format. These signals can be in HD (high definition) or SD (standard definition). The majority of signals are transmitted in the UHF spectrum (channels 14 to 69), but some are still in the VHF spectrum (mostly Hi-band channels 7 to 13). Most indoor antennas being sold today are designed for UHF reception. To be effective for VHF, the antenna would need two horizontal rods to receive quality VHF signals. In the Lansing/Jackson area channel 10 (NBC) is broadcast VHF. In Grand Rapids market channels 3, 8, 35, 13 & 52 are broadcast on VHF and are on channels 8, 7, 11, 13, & 5 respectively. In the Detroit market channel 2 is on 7 VHF and 9 out of Windsor is VHF. In the Flint market channel 12 (ABC) is VHF. Digital signal today has a typical range of 50 to 60 miles under normal conditions. Not all TV transmitters are equal. They can vary in height from a few hundred feet high to 1000’ or more. The elevation of these towers relative to the surrounding service area is a factor. Many towers are placed on the highest ridges to add distance to their signal profile. Transmitters also have various licensed transmit power, which is licensed and regulated by the FCC. Terrain & foliage between your home and the tower will also affect the quality and ultimate range of the signal. 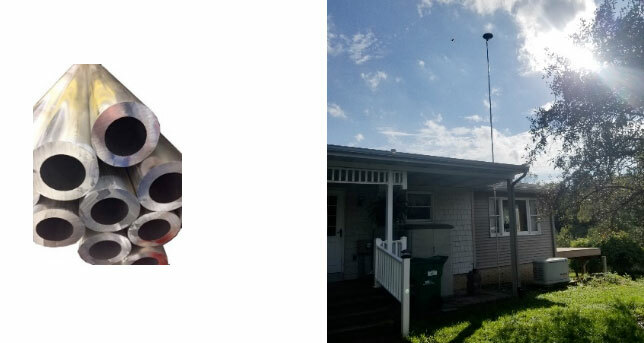 The height of the antenna at your home will also affect the range and performance of the receive signal. There are antenna companies that are rating their antennas in mileage with claims of 100 to 150 miles. This may be possible under extremely rare conditions but not typical in Michigan. The true rating of an antenna is in dB of gain. One should be able to obtain the performance profile of any antenna at each frequency across the broadcast spectrum. 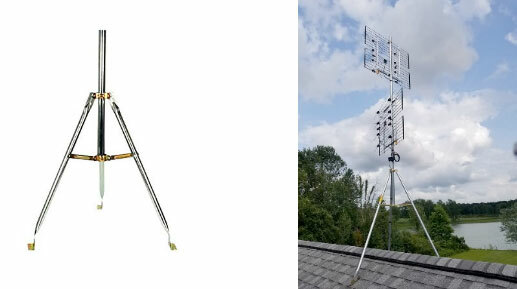 The best long-range antenna systems are comprised of high gain antennas, good low-noise high gain preamplifiers, quality RG-6 or RG-11 coaxial cable, and good distribution techniques and should be grounded/bonded to NEC requirements. 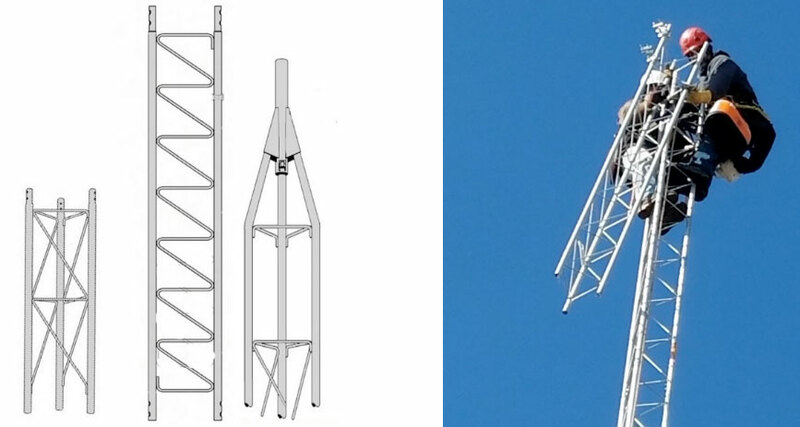 A 40’ to 60’ or higher tower will add range to the system. Beware of Outrageous Claims: Outrageous claims remind me of the time that Amarillo Slim, a famous gambler made a wage that he could hit a golf ball a mile with a PGA certified driver and a PGA certified golf ball. He took many bets, and on a favorable day (good tail wind) he took his doubters to a ridge over a frozen lake and proceeded to hit a golf ball over 1 mile. DO THE ANTENNA MEN SERVICE MY AREA?